Rising nearly 7000 metres into the clear blue sky above Nepal’s rugged Annapurna mountain range, Machapuchare is arguably the most untouched place on Earth. Believed to be one of the homes of the Hindu god Shiva, its isolated summit sits alone in the sky – unclimbable and untouched. 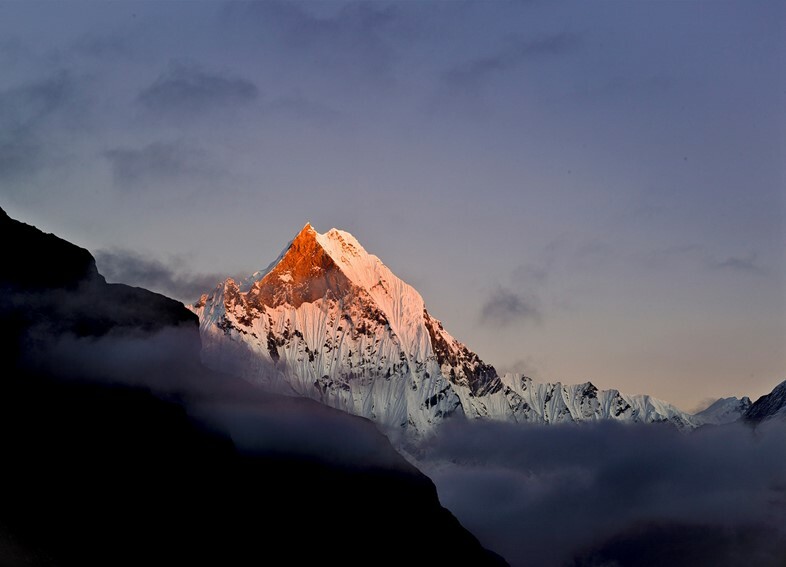 Officially, Machapuchare has never been summited, making its ethereal heights one of the least-visited places on Earth. In the late 1950s, a British expedition ventured to within 500 feet of the summit before doing the gentlemanly thing and turning back – having agreed with the king that they would not set foot on the sacred summit. Machapuchare’s peak remained untouched thereafter, but of course someone always has to ruin a good thing. That someone is rumoured to be New Zealander Bill Denz, an accomplished solo climber with the proven skill to attempt such a dangerous climb. It’s widely believed that he made an illegal ascent of Machapuchare in the early 1980s, becoming the first and very likely only person to ever set foot at the sacred mountain’s summit. Since he died in an avalanche elsewhere in the Himalayas in 1983, we’ll never know the full story. 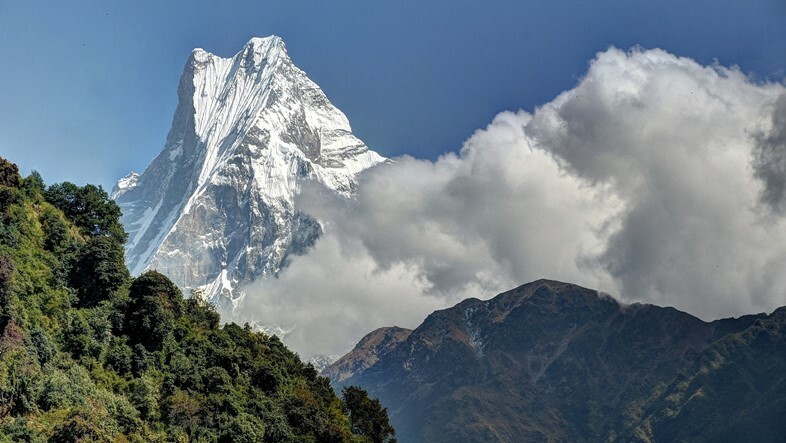 Unlike some other well-known mountains in Nepal and Tibet, which start their skyward climb high amid other mountains, Machapuchare’s spectacular beauty is accentuated by its steep, sheer and rapid rise from the lowlands below. Lying just 24km north of the lush subtropical city of Pokhara, it’s a full 6000 metres higher; making for picture postcard views as seen from the lakeside city. 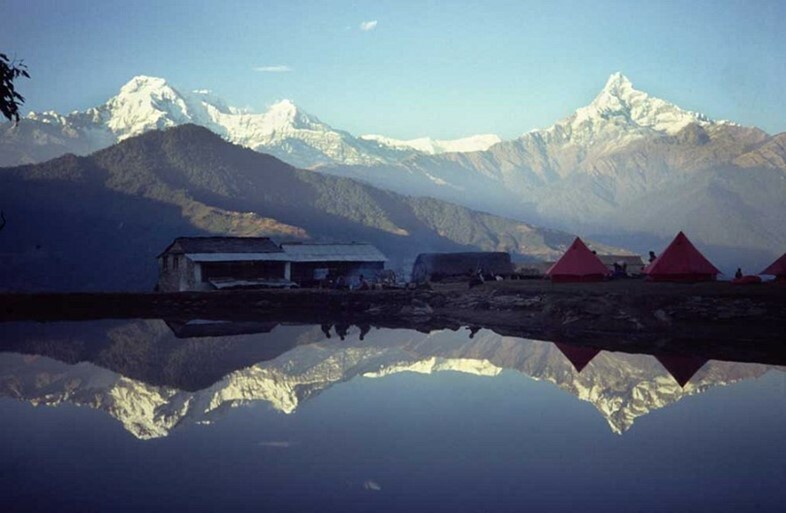 Its name in Nepali means ‘fishtail’ – alluding to the mountain’s twin peaks and notched summit. Like other mountains in the Himalayas, Machapuchare’s geological genesis story is no less magical than the religious and climbing lore surrounding it. Formed by the collision of the Indian tectonic plate with the Eurasian landmass some 50 million years ago, it lies just within the Tethyan Himalayas – a region created by the uplift of the ancient Tethys Sea which once separated the colliding plates. Here, amid the highest mountains on Earth, silent, remote valleys hide glistening sand and well-preserved fossils of marine creatures that lived on the seafloor thousands of feet down and millions of years in the past. Today, Machapuchare lies within the Annapurna Conservation Area. Established in 1992, it’s Nepal largest – spanning over seven and a half thousand square kilometres of incredible terrain including the 8091m high Annapurna I peak and the world's deepest river gorge, the Kali Gandaki. It’s home to 474 bird species, 39 species of reptiles, 22 amphibians species and over a hundred different mammals, not to mention 1226 species of flowering plants and the world’s largest rhododendron forest. 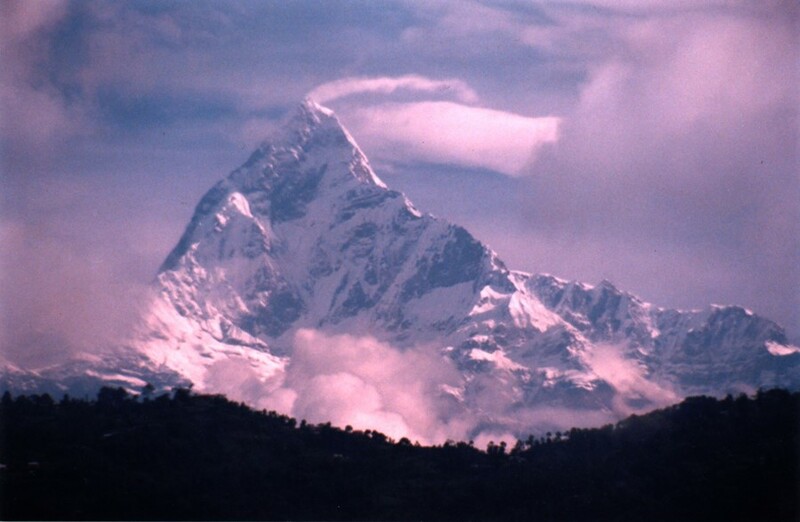 In the three decades since Denz’s reputed summit climb, Machapuchare’s peak has remained isolated and pristine. With other mountains becoming increasingly covered in trash, the climbing ban means Machapuchare will remain one of the last places on Earth truly beyond our reach. Although you can’t climb it, trekking companies in the Annapurna region of Nepal can take you to Machapuchare Base Camp at 3700m. It’s possible to stay overnight and explore the surrounding sanctuary, which is bordered by the towering peaks of Annapurna South, Hiunchuli and Machapuchare itself. World Expeditions has a trek departing in October 2016 for approximately £1330 while Keep Walking Nepal has a series of Autumn 2016 treks starting at £1375.